Although today’s big Houdini news is that developer SideFX is to provide users of the Houdini Indie edition with a free supplementary licence, users of Houdini Core and Houdini FX also get something to celebrate. 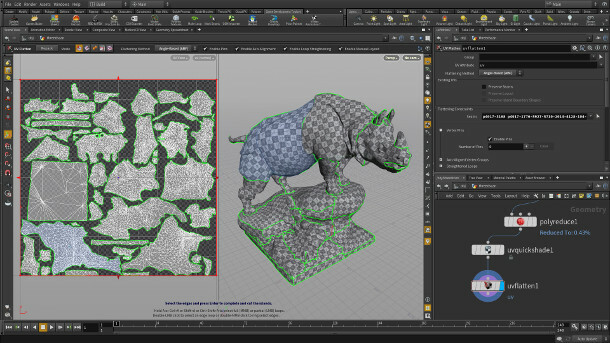 The latest production build of the software, Houdini 16.5.378, updates both the software’s UV toolset and its handling of FBX files, in ways that should be particularly useful to game artists. The rewritten UV Flatten node now includes both spectral and angle-based (ABF) UV flattening, and there are new tools for defining seams between UV islands, and manipulating their size, shape and orientation. There is also a new Repack button to optimise the layout of UV islands and remove overlaps. Other changes include the option to specify exactly which objects to import when importing an FBX file via the File node. For game artists, LODs can now be imported or exported to FBX files, and there is a new option to disable the export of end effectors to make export of rigged characters to game engines in FBX format more reliable. SideFX has also made the source code of its FBX exporter available on GitHub, making it easier for studios to create their own custom export pipelines. Houdini 16.5 is available for Windows 7+, Mac OS X 10.10.2+ and a range of Linux distros. Perpetual node-locked licences cost $1,995 for Houdini Core or $4,495 for Houdini FX, and there are a range of rental and studio licensing options. See a comparison table of the editions.